Chattanooga, Tenn., is nicknamed the "Scenic City," but is there a scene for millennials? 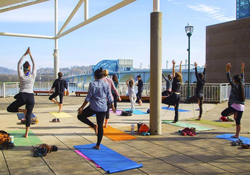 From morning yoga to skydiving and rock climbing to unique restaurants, bars and distilleries to nighttime concerts, millennials can pack a lot into a visit to Chattanooga. “Chattanooga is going through a music and entertainment renaissance and offers more diverse experiences than ever before. From incredible music and film festivals to weekly events like Noon Tunes and Nightfall, we’re definitely a city that appeals to millennials,” says Candace Davis, marketing and public relations manager at the Chattanooga Area Convention and Visitors Bureau. 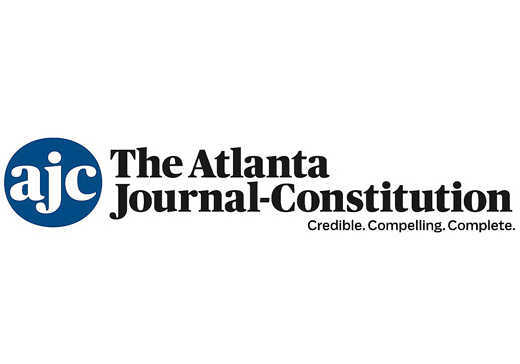 Its location about 120 miles from downtown Atlanta also means millennials can check out some of Chattanooga&apos;s trendy restaurants and Instagram-worthy activities on a quick overnight trip or during a long weekend. “There’s always something going on,” added Davis. Homemade flaky buttermilk biscuits are the base for a surplus of breakfast sandwiches at Maple Street Biscuit Company. The community-style seating makes it easy for you to talk to a local or another visitor about their favorite things to do in Chattanooga. Open seven days a week. Cadence Coffee Co., a local coffeehouse, serves handcrafted espressos, fruit smoothies, and hot and iced drinks, along with acts of kindness. Cadence Coffee works to fight against homelessness, poverty, human trafficking and unemployment by partnering with nonprofits and hiring those who have come upon hard times. Closed Sundays. Chattanooga Skydiving Company offers spectacular views and an adrenaline rush for new and experienced jumpers. If it is your first time, you can get trained and ready to jump with an experienced tandem diver in less than an hour. It&apos;s a 30-minute drive from downtown Chattanooga. Open seven days a week. Check out regional and local handmade crafts, art, jewelry and more at the Chattanooga River Market. Located at the Tennessee Aquarium Plaza, the River Market also offers live music while you&apos;re shopping. Check out the website for special events like River Market Yoga. Open Saturdays through Labor Day weekend. Their flagship Chattanooga Market is open Sundays, 11 a.m. to 4 p.m., from May through December at First Tennessee Pavilion. For lunch, head to Flatiron Deli for specialty sandwiches, wraps, salads and sides, including vegetarian options. It&apos;s an option for a visit during the week because it&apos;s closed Saturday and Sunday. Rated as favorite for Chattanooga by TripAdvisor, Super Amped Sports can get your heart pumping and give you a close-up look at the area&apos;s natural beauty. You will drive a Polaris RZR on a two-hour tour, led through 400-plus acres by a guide in a vehicle in front of you. Open seven days a week. Named a Southeast must-see attraction, Ruby Falls is an underground cave with a stunning waterfall. A guide will point out geological wonders during the tours, which lasts two hours. On its website, you can buy a package deal for the falls and other activities like the ZIPstream Aerial Adventure and Rock City. Open seven days a week. 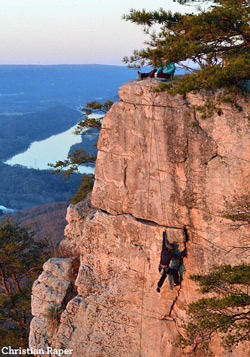 Sunset Rock is known for being one of the best traditional rock climbing spots in the Southeast. Sunset Rock, which is part of Chattanooga National Military Park and Lookout Mountain Battlefield in Chickamauga, has more than 100 trails for climbing, hiking and trail running. Open daily from 6 a.m. to sunset. Love going out on the water but don&apos;t want to pack your kayak? Live Life Outside rents outdoor recreational gear such as equipment for stand-up-paddleboarding (SUP) and winter activities. Open seven days a week. Head to Warehouse Row for shopping and dining in one place, and one with history. The buildings previously were used as a Civil War fort and then a district for textile warehouses. Now, restaurants and stores include Tupelo Honey Cafe, Two Ten Jack, Brash Coffee, Anthropologie, Lululemon Athletica and J. Crew. Open seven days a week. During the afternoon or evening, take a tour through Chattanooga Whiskey, the first downtown distillery in 100 years. A guide talks you through the process of how the whiskey is made from "grain to glass." During the tour, you will see the old barrel staves and their beloved still, named "Doc." And yes, there&apos;s samples. Open seven days a week. If you prefer beer, head to Chattanooga Brewing Company, which maintains six of its classic beers on tap plus seasonal and specialty beers. Event nights include Brewga, where you can participate in a yoga class and then enjoy a free pint afterward. Open seven days a week. If you&apos;re visiting on a Friday night in the summer, check out the free Nightfall concert series. Located at Miller Plaza in downtown Chattanooga, Nightfall happens rain or shine, until the end of August. Tired of the same old drinks? Try the "candy shop shots," such as black raspberry warhead and tropical fruit punch lifesaver, at Clyde&apos;s on Main. While you&apos;re there, watch or compete in one of its popular ping pong tournaments. Open seven days a week. 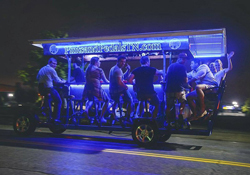 Pedal the night through downtown Chattanooga with Pints and Pedals. On the two-hour guided ride, passengers will hit three to five local bars or restaurants. The bike can seat up to 15 people and it&apos;s a fun option for bachelor/bachelorette parties and birthday parties.